To identify relevant studies, we searched PubMed, Google Scholar, and our in-house electronic library for peer-reviewed articles and research reports published in English through 2014 related to the Alzheimer's population and their caregivers. We also searched the Internet for gray literature using similar search terms. We included studies and reports that provided evidence of racial and ethnic disparities, discussed reasons for disparities, or described interventions to address disparities, including other reviews, books, government and non-profit research reports, and research studies published in peer-reviewed journals. 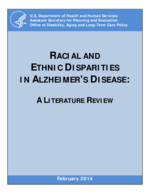 Our searches of the peer-reviewed literature combined free text and Medical Subject Heading (MeSH) terms, such as "disparities," "disparity," and "discrimination," with free text and MeSH terms for Alzheimer's disease and dementia ("dementia" OR "alzheimer disease" OR "cognitive impairment"). Journal articles were required to have an abstract and pertain to human subjects. Our initial search located 151 article abstracts. After excluding articles that were clearly irrelevant based on their title or abstract, we reviewed the full texts of 35 refereed articles and 15 other sources (books, reports, web pages, etc. ).